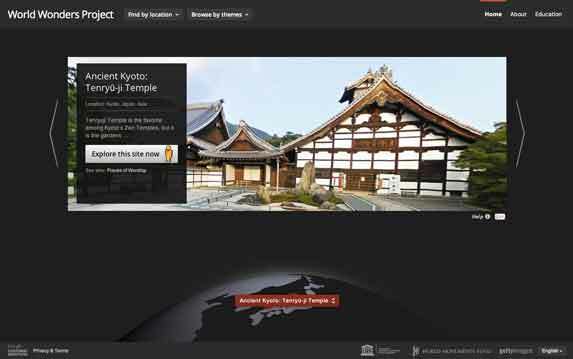 The Google World Wonders Project is a platform which brings world heritage sites of the modern and ancient world online. Journey to more than 130 world heritage sites across the globe—like Stonehenge, the Palace and Garden of Versailles, temples of ancient Kyoto or The White City of Tel-Aviv. With videos, photos and in-depth information, you can now explore the world wonders from your armchair just as if you were there. Advancements in our camera technologies allow us to go off the beaten track to photograph some of the most significant places in the world so that anyone, anywhere can explore them. The World Wonders Project also presents a valuable resource for students and scholars who can now virtually discover some of the most famous sites on earth. The project offers an innovative way to teach history and geography to students all over the world. Together with partners including UNESCO, the World Monuments Fund and Cyark, the World Wonders Project is preserving the world heritage sites for future generations.